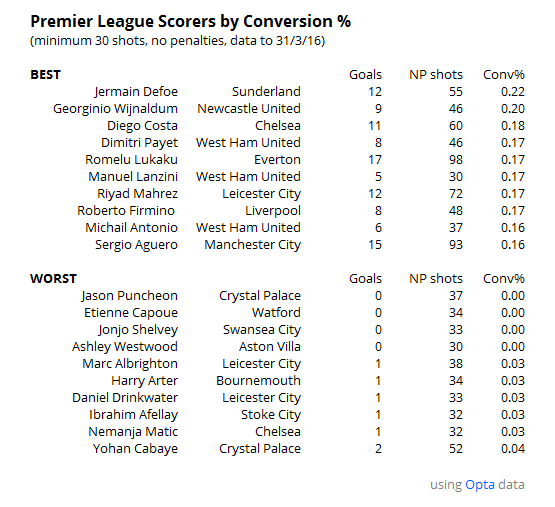 Into the Stats: What's Going On In The Premier League? The first week of April might seem a strange time for a football team to go on holiday, but it seems we already find those stranded in mid-table doing just that; or at least some of them. Bournemouth continued their terrible record against this season’s top four, they’ve managed two draws against Leicester but lost all their other six fixtures, scored three and conceded 22 and Watford, seemingly coasting home, have fared even worse having lost 7/7, while scoring three and conceding 16. All this poses the question: how good are these teams? Bournemouth, despite offering nearly nothing against the top four, have been a superior team outside of these games. I’m not going to suggest that it’s been strategic to maximise their play in more competitive games, but it sure would make sense to expend more energy at 1-1 against West Brom or Crystal Palace than go hell for leather when 4-1 down to Tottenham. In more balanced fixtures, they have been defensively strong while putting forward a league average attack. That’s good stuff for a newly promoted team and explains why despite some genuine awfulness in those higher profile fixtures, they are sitting comfortably in 13th with the comfort of no more top four fixtures to come. For the whole season, Watford’s defence is around league average and their attack is slightly below par, but since the half way point, their attack has been pretty woeful; they are scoring an average of half a goal a game. Why? They are taking under ten shots a game and getting under three of them on target. Who? Odion Ighalo has one league goal in 2016. Not to call Watford a one man team but, well, in attack, they largely have been. We’ve seen this before, a player lands in the league, gets hot quickly, scores a ton, attracts transfer talk and sometimes achieves one, then fades. All the more reason to work out if a player has been on a streak or is prone to streakiness before you part with the cash and why goals are merely the icing on a cake: ingredients are all important. For some reason a variety of Newcastle United associated players (Andy Carroll, Demba Ba, Papiss Demba Cissé) are coming to mind here. Again though, criticism of a newly promoted team should be tempered against the fact that they aren’t getting relegated; this is literally page one in the “What to do when you reach the Premier League” playbook. And it’s entirely possible that the hat-trick could be secured after Norwich City overcame Newcastle in a huge game this weekend. That the three teams under greatest threat of demotion, Sunderland, Newcastle and Aston Villa have all suffered from varying degrees of hapless leadership over multiple years, both on and off the pitch, is probably the most positive indicator to have come out of this strange and turbulent season. I filled one of the many empty seats at Villa Park this weekend (and wrote about it), and the deficiency in the standard of the team put out was clear to see as Chelsea’s reserves brushed them aside with next to no fuss. They had miniature midfielders, a back four full of yesterday’s men and one tactic that seemed only half conceived–fire it up to the big man, but don’t follow up. Of course the league’s bottom team is likely to be bad, but that degradation of quality has taken place over a number of years and this relegation could well have occurred before. That it has not, and that Sunderland have survived so long in similar circumstances, has lead to wrongs left without being righted and with the Championship beckoning Villa particularly could be vulnerable to a long stretch. Back to the point about teams being on holiday, we find West Brom having reached the Pulis Line: 40 points. Oh West Brom are on holiday? No chance, this was possibly the most Tony Pulis performance of the whole season. Three shots in total, none of which were on target meant the seventh on target blank of the season, five of which have been away from home and the fifth in the last ten games. Enough for a point though? Sure, because repelling twenty two Sunderland shots is easy– if you are managed by Tony Pulis. With their fifth 1-0 victory in six games, the reality of a Leicester title is genuinely upon us. I have noted all season the various benefits of skew that the team has enjoyed but at no point did I truly expect them to hold out initially for the top four and once that became impossible to deny, the title. While their likely achievement should be applauded as possibly the biggest odds ever defied in a sporting event (5000/1), that those odds were so long accurately describes the unlikelihood of this coming to pass. The twin powers of Jamie Vardy and Riyad Mahrez powered the first half of this season and only latterly has the team’s focus on defence and the skills of N’Golo Kanté and the defense garnished praise. Will Gurpinar-Morgan is writing on Leicester for StatsBomb this week, so I won’t labour a point but in a points estimation I created I have them about plus 17 points compared to where you might expect given their shot profile. That’s huge and they have excelled and overachieved where all others have failed to do the same. The perfect storm. In particular, the weird incongruent nature between Arsenal’s reality and the expectation formulated by their focus on shot location has created a scenario in which despite underachieving, they will probably end up in a similar position to usual. Maybe a bounce up to second place will actually reflect a step forward and technically successful transition towards their tactic of more selective shooting, but even with the benefit of skew, to have failed to mount a sustained challenge at the very top goes down as a disappointment. Similarly for Manchester City, stymied largely by combinations of luck and injury, they will probably look back in May and wonder how they failed to build on their exceptional start and contend. Less is wrong with these two giant clubs than the simple narrative will lead many to believe. Mass clear-outs will not be necessary and both teams will probably be able to regroup and compete next year with just a couple of core signings, probably fewer at Arsenal, as is Arsene’s way. 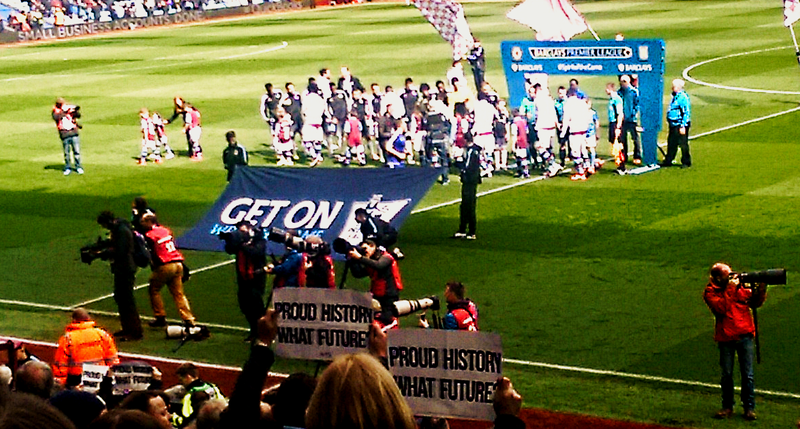 Tottenham should reflect on a season of great steps forward and to mourn the title that never was would miss the point. Young, dynamic and full of shooting boots, they should be able to maintain this level of performance going forward and challenge towards the top end once more. It doesn’t look like their starlets are going to get picked off but that’s the one note of caution worth adding. If Daniel Levy is smart, and evidence suggests he probably is, then he’ll put his moody hat on this summer and concentrate on enticing to a top class central midfielder, a forward option and leave his phone on silent. Couple of charts to take a look at player stats. Important to remember that these are all, in the scheme of things, short term skews in fields that do not necessarily indicate future outputs. However, particular extremes may be considered more likely to revert to individual means than not. 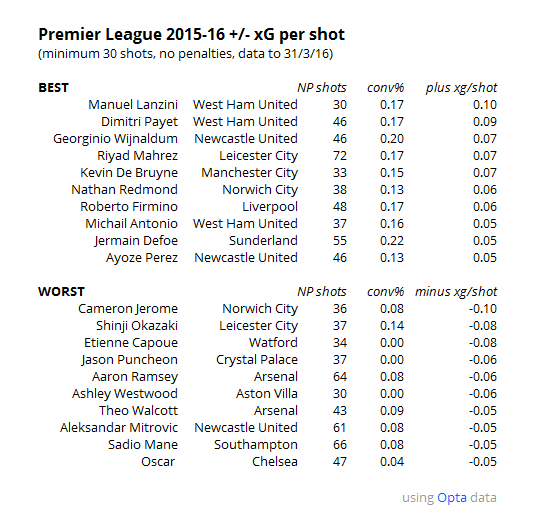 Hmm… three West Ham players in the top ten? That’s interesting. Well, how about that, it’s those three West Ham guys again! We’re looking at similar things, so that’s not the greatest surprise but there are notable other entrants in these lists. Shinji Okazaki’s all shot conversion of 14% is superficially decent, but when matched up against his expected goals, he’s undershooting by a fair margin. Being the point on the front of Leicester’s attack and most notably having Jamie Vardy and Riyad Mahrez serving up your chances means you should be scoring more than five goals. Ramsey and Walcott’s presence on the naughty list is no surprise to those of us up to speed with Arsenal but it’s interesting to find two players who may well attract the attention of suitors in the summer on there too. Aleksandar Mitrović and Sadio Mané both look ripe for a transfer, Mitrović having shown more than enough promise to feel that a Championship demotion would be too much at this stage of his career (wait, another Newcastle striker!) and Mané having possibly stayed a year more than anticipated at Southampton. Each has clear room to improve on this year’s numbers, as Mitrović notably showed at the weekend and Mané, frustratingly, did not. The goals may have been less plentiful than desired but the quality remains. Roberto Firmino is a tricky one to get a handle on. His first big season was in 2013-14 where he scored 14 non-penalty goals for Hoffenheim and overshot his expected goals numbers significantly. This was quickly countered with the opposite in 2014-15 and now after taking a little while to settle down and struggling to nail a definite position he’s back to overshooting expectation once more. He looked to be a solid acquisition in the summer with clear potential to grow into a top player and i’d still err on the side of positivity going forward. As with many things Liverpool, Firmino looks to be on the cusp of something good, a theory advanced eloquently by Dustin Ward here on StatsBomb mere days ago. So the title is won, relegation is decided, the top four looks locked down. Not much left to say really? Ha, forget it. Plenty more to come, i’ll bet. Analytics in Football – Have the Geeks Inherited the Turf? We also have plenty more to come this week so keep alert and don’t miss out.